Central Java comprises about a third of the island of Java. The province is 32,800.69 km2 in area, approximately a quarter of the total land area of Java. Its population was 33,753,023 at the 2015 Census; it the third most populated province in both Java and Indonesia after West Java and East Java. 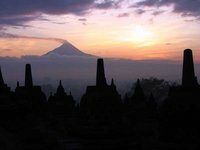 Central Java is also a cultural concept that includes the Special Region and city of Yogyakarta as well as the Province of Central Java. However, administratively the city and its surrounding regencies have formed a separate special region (equivalent to a province) since Indonesian independence, administrated separately. Located in the middle of the island of Java, the Central Java province is bordered by West Java and East Java provinces. A small portion of its south region is the Yogyakarta Special Region province, fully enclosed on the landward side by the Central Java province. To the north and the south, the Central Java province faces the Java Sea and the Indian Ocean. Central Java includes offshore islands such as Karimun Jawa Islands in the north, and Nusakambangan in the southwest. Yogyakarta is historically and culturally part of the Central Java region, although it is now a separate administrative entity. The average temperature in Central Java is between 18-28 °C and the relative humidity varies between 73–94%. While a high level of humidity exists in most low-lying parts of the province, it drops significantly in the upper mountains. The highest average annual rainfall of 3,990 mm with 195 rainy days was recorded in Salatiga. The geography of Central Java is regular[clarification needed] with small strips of lowlands near the northern and southern coast with mountain ranges in the centre of the region. To the west lies an active stratovolcano Mount Slamet, and further east is the Dieng Volcanic Complex on Dieng Plateau. Southeast of Dieng lies the Kedu Plain, which is bordered to the east side by the twin volcanoes of Mount Merapi and Mount Merbabu. South of Semarang, lies Mount Ungaran, and to the north-east of the city lies Mount Muria on the most northern tip of Java. To the east near the border with East Java lies Mount Lawu, where its eastern slopes are in the East Java province. Due to its active volcanic history, volcanic ash makes Central Java highly fertile agriculture land. Paddy fields are extensive, except in the southeastern Gunung Kidul region partly due to the high concentration of limestone and its location in a rain shadow from the prevailing weather. The largest rivers are the Serayu in the west, which empties into the Indian Ocean, and the Solo which flows into East Java. The Borobudur is a giant Buddist temple complex, built in the 8th and 9th century. The building has nine so-called stupas. The first 5 make up the piramidacal base of the structure, on top of that are 3 circular stupas and finally there is one big stupa on top of all the others. Around the 3 circular stupas are 72 open stupas with statues of Buddha inside. In the 10th of 11th century the temple was abandoned, and only rediscovered at the end of the 19th, after which the structure was cleared from the vegetation, and finally at the end of the 20th century it was restored with the help of the UNESCO. An hour's drive from Borobudur are the Hindu Prambanan Temples, which are also on the UNESCO World Heritage list. Mount Merapi is an active stratovolcano and currently the most active one in Indonesia, erupting regularly for since almost 500 years, most lately in 2010. It's one of the 16 potentially deadliest volcanoes in the world because of its large populations living on or near the mountain slopes. It's just 30 kilometres from the city of Yogyakarta but people are living up to 1,700 metres high on the slopes of the volcano, with the total hight just under 3,000 metres. Although not particularly of interest for travellers (unlike for example Mount Bromo), Mount Merapi sure makes for a great sight and wandering around the villages below the mountain is a nice way of spending an afternoon (if possible!). On top of that, in 2004 an area of 6,410 hectares around Mount Merapi was established as a national park, ironically leading to the fact that fewer people were ready to leave their homes during the 2006 eruption because they were afraid the area would be incorporated into that national park. The Merapi Museum Center in Yogyakarta is of interest, with a replica of Merapi's Post 2010 Eruption. Adisucipto International Airport (JOG) near Yogyakarta has a few international connections, including flights with Air Asia to Kuala Lumpur and Singapore. All other flights are domestic, including those to Jakarta, Bandung, Surabaya (all on Java), Balikpapan, Banjarmasin, Pontianak (all on Kalimantan), Denpasar (Bali) and Makassar (Sulawesi). Purwokerto, Yogyakarta, Solo and Semarang are connected to other cities with intensive railway service, providing various classes of accommodation for all budgets. Central Java cities often have more than one railway station, a legacy of the many private railway lines during the colonial era. Semarang's Tanjung Emas port is the only one of any practical significance to traveler entering Central Java. This port could be a convenient entry point by sea from cities in Kalimantan, such as Banjarmasin, Pontianak, Kumai, Ketapang, and Sampit. The region is well served by trains with two main lines. The North Line runs along the north coast linking Solo, Semarang and Tegal, with stops in between. The South Line links Solo and Yogyakarta with small towns on the south coast. There is also a north-south cross island line in the west of the region, passing through Purwokerto. The loop line in the northeast of the region linking Semarang with Jepara and Kudus is long disused despite still being shown on many maps. Hiring your own car is the most convenient way to cover some of the large distances between reactions in the region. Even by Indonesian standards though, driving practices in Central Java will scare most visitors. You will enjoy your visit more and certainly be much safer, if you hire a car with driver. Buses are very widespread in this region servicing cities, towns and to a lesser extent, rural areas. Gudeg - A coconut-infused stew of young jackfruit, chicken and hardboiled eggs with a subtle sweet and savoury taste. Vendors all seem to have their own secret recipes for Gudeg, but the flavour base usually seems to include bay leaf, coriander, candlenut, onion, garlic, galangal, ginger, palm sugar, and unusually, teak tree leaves. This is a Yogyakarta speciality and is sometimes called Gudeg Yogya. The not-to-be-missed dish of the region. Best tried in Yogyakarta but you will also find it elsewhere. Bakpia - A small sweet pastry, traditionally filled with sugary mung bean paste. Other fillings are now sometimes used with cheese being especially popular. These originated in the Pathok district of Yogyakarta and are also called Bakpia Pathok. A box of Bakpia travels quite well and is a very authentic gift for any visitor to take home. Lumpia Semarang - Lumpia (spring rolls) could almost be the national dish of Indonesia, and the Semarang variety is one of the very best. Fillings vary but always include bamboo shoots. Dipping sauce might be sweet soy with chopped fresh chillies (sos manis paket cabe potong), spicy sambal or a sweet garlic, tomato and chilly blend. Look for streetside vendors and always choose the busiest - locals will know for sure who makes the best Lumpia. Bakso Solo - Bakso (meatballs in hot broth with noodles, various vegetables and chilly sauce) wil be well known to any visitor to Indonesia. The Solo version uses truly huge super sized meatballs. Typical Indonesian humour has resulted in this dish sometimes being called "Bakso Tennis". Nasi Bogana - This very convenient dish has almost fastfood status across Indonesia these days, but it originated from Tegal on the northern coast of this region. White rice accompanied by a whole host of other possibilities is tightly wrapped in a banana leaf packet. It can then be heated by steaming at any time inside the packet - hence the convenient fast food tag. Accompanying dishes could be chicken curry, tempe (fermented soya beans), tofu, egg, dendeng (spicy beef jerky), chicken livers etc. Most likely is a combination of them all. If you are travelling on a budget, keep an eye out for Nasi Bogana street hawkers in any city or town. Opor ayam is a chicken cooked in coconut milk from Indonesia, especially from Central Java. usually eaten with ketupat and sambal goreng ati (beef liver in sambal). If you have only one or two days to visit, it is better for you to choose Yogyakarta as your hub, because there is more sightseeing around there. You may sleep in Semarang, if you want explore Semarang. Other areas might not be as interesting for foreign tourists. This is version 23. Last edited at 20:38 on Jan 31, 19 by theo1006. 14 articles link to this page.